Blue house, blue creek, blue cassowaries. Cassowary Blue was completed in 2014 . The holiday house is designed with the latest eco-friendly principles and technology . The house is fully screened and sealed from wildlife or insects entering whilst being very open and cool . The property has it's own small, private waterhole . It is on a quiet dead end road having cleared areas around the house and walking tracks surrounded by conservation protected, untouched rainforest and creek. There is a verandah and two other outdoor seating areas on the banks of the creek. Centrally located in the Daintree area it is close to to Cow Bay Beach and Thornton Beach also swimming holes, the general store , the Daintree Discovery Centre and the Cow Bay Hotel with bottleshop, good value meals and drinks and a chance to meet the locals. For quality restaurants Heritage Lodge and Link Haven are close by . This is a purpose built holiday house with new fixtures , furniture and appliances . We have movies, music , books ,games and a BBQ . There are bathroom essentials and basic pantry supplies : tea, coffee, sugar, salt, pepper, cooking oil, cereal , long life milk and 2 minute noodles. It has two separate bedrooms for a maximum of 4 adults or 2 adults and 2 children, with a king size bed in the main bedroom and a second bedroom with 2 x single beds. Perfect for couples . Well behaved children over 7 with an interest in nature are welcome. Not suitable for children under 7. Be aware , as with most holiday houses in the Daintree, there is no tv reception or internet ,mobile phone connection is unreliable and we have a stand alone power system. All of the photos were taken on this property including the photo of the cassowary. Your booking includes return Daintree ferry tickets - a saving of $25. Great place to pause in the Daintree. We would, when able, be happy to return. A few comments on how it could be improved were made in the guest book. It’s a beautiful place, set up perfectly and had everything we needed. Incredible scenery around the home and the rock pools are a fabulous bonus. It felt like home. The property was beautifully maintained and very clean. The location was perfect, secluded and very peaceful with only the sounds of the Daintree to keep us company. A great place to stay and enjoy complete relaxation. Well euipped and very comfortable we loved our stay at Cassiwary Blue - we even saw a cassowary on our last day. 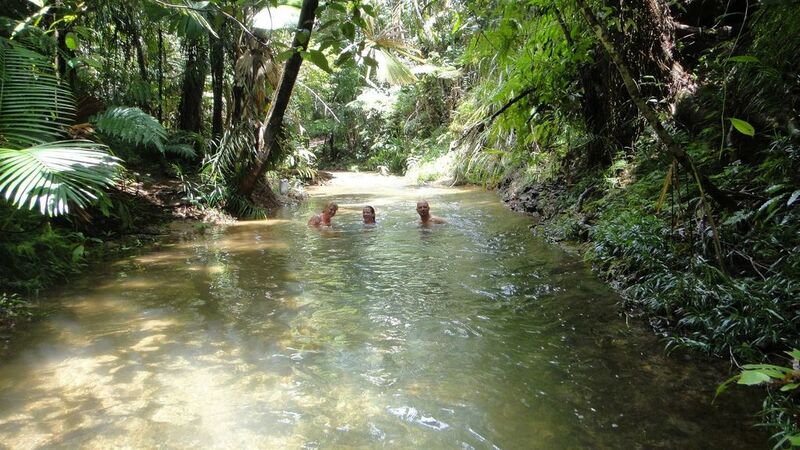 We fully explored the Daintree over 5 days - swam at the Mason Cafe swim hole (no crocs! ), ate at the Cow Bay pub and walked the many boardwalks and beaches. fabulous retreat away from it all! Thanks Andrew and Melissa for making your property available. It was so well set up, a great location, and had everything we needed. You made it easy to understand how to get there and helpful with suggestions of things to do. I would highly recommend Cassowary Blue to others and really did not want to leave.